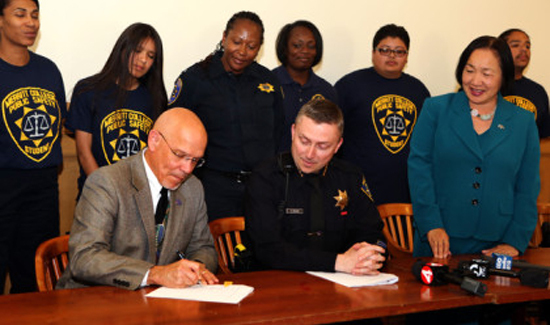 Margaret Dixon, (third from right, standing) is a retired Oakland police officer who teaches classes—including one on policing and community relations— at Merritt College, in Oakland, Calif. Depending on who you talk to, the concept of community policing is either a radical, untested, and revolutionary idea, or something that worked well in the past that for whatever reasons has fallen out of favor today. At a panel discussion on U.S. policing at New York University School of Law, attendees might have gotten the impression that cops living in or near the places where they work and actually talking to residents that they’re not arresting is a novel, long-overdue approach to building relationships between law enforcement and the public. That’s confusing to some longtime law enforcement observers. Community policing, which is often confused with “broken windows” models, isn’t some radical departure from traditional policing models—it’s a tried-and-tested way of going about the job that reduces police/community friction, lowers crime rates, and generates collaboration. But as residency requirements have been abolished and American policing has moved toward a warrior/paramilitary model, some old-timers are trying to bring back things like getting out of the cruiser and talking to residents and encouraging locals to become cops where they live. According to an article from NPR: “Margaret Dixon, a fiery retired Oakland police officer, grew up in a rough part of this city of 400,000. These days she’s teaching classes at Merritt College, an Oakland community college—including one on policing and community relations.